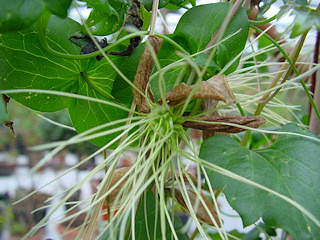 Clematis cirrhosa var. purpurascens 'Freckles' is a clematis in my garden which has flowers throughout the whole year, but most flowers start in November. 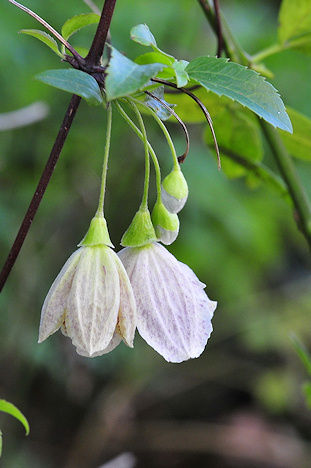 It is an evergreen clematis with beautiful green leaves. Allen Paterson, who was at curator of the Chelsea Physic Garden, collected seeds at the Balearic Island of Mallorca and Raymond Evison selected the plant with the most red spotted flowers and named this selection 'Freckles'. 'Freckles' was the nickname of the raiser's daughter, Rebecca. The variety has received the Royal Horticultural Society's Award of Garden Merit. The plant was introduced in 1989. The plant is a quite vigorous and evergreen climber and grows 3-4 metres long. The single nodding flowers are creamy pink on the outside and creamy white on the inside with a lot of reddish maroon dots. The size of the flower is 5-7.5 cm across. The four sepals are 3-4 cm long and 2-2.5 cm wide. The stamens are green-yellow. 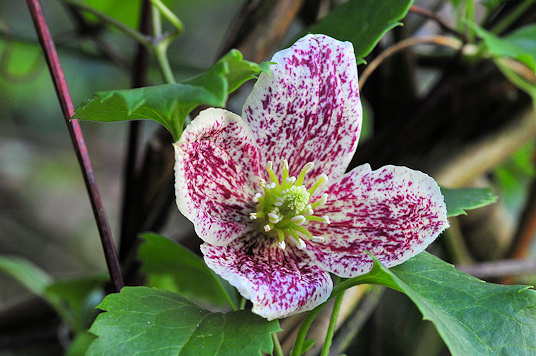 The flowers are lightly scented but not special as there are better scented clematis available. 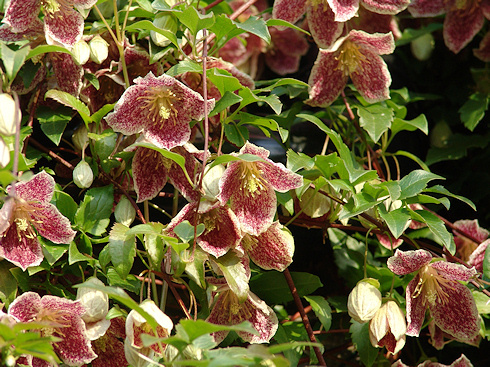 This fern-leafed clematis has light green young leaves and mature leaves are dark green. The leaves may turn to bronze in the winter. Flowers are produced throughout the whole year but the main flush appear over winter. 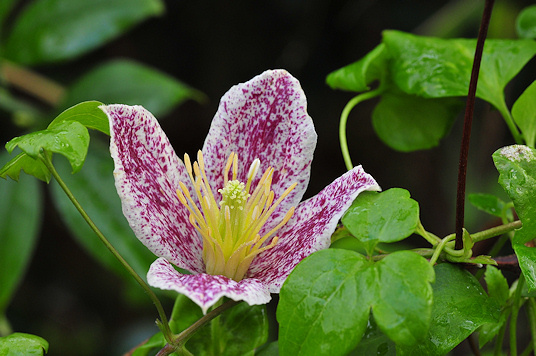 Therefore this clematis is very attractive because we have flowers in the garden at a time when there are almost no other plants in flower in our garden. The plant can be pruned to keep it under control and this should be carried out after the main flowering period. It can be cut back to 1 metre. Pruning is not necessary if you have enough space for a larger plant. This evergreen clematis is ideal for training over a sunny pergola, fence or arch. If you let this clematis grow in a tree then you have an evergreen tree with flowers which will be a beautiful combination. This clematis is very useful in the garden. 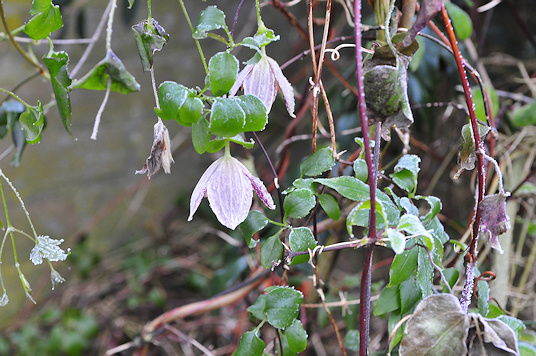 When I had 'Freckles' the first year I had read that this clematis is not hardy in the Netherlands. I made several cuttings and I gave a young plant to a gardener in my village who lived on the outskirts of the village. I was very surprised when he called me in winter and told me that his 'Freckles' had flowers in the snow. He has his garden so that the cold wind comes from the north into his garden. Even this year (-18 degrees Celsius) the plant survived in the garden. I also have had several cirrhosa cultivars in my garden for many years without any problem so my opinion is that these cultivars can be grown in the garden in the Netherlands. However, note that the plant must be in a rather dry place in the garden during winter. Ton has given an excellent insight into the origin, type, form, and growing habit of C. cirrhosa var. purpurascens 'Freckles' as well as the benefit of his experience growing this cultivar. 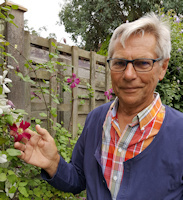 To reinforce the message that this is a cultivar to have in your garden, Roy Nunn has sent me the picture to your right to demonstrate just how floriferous this plant is. Many thanks, Roy.